No. 375 Tunitas Beach, Indian village site on Portola route. Tunitas Creek Rd. spans from the scrub-brush cliffs of Highway 1 on the San Mateo County coast to the redwood-tree ridgeline, over nine miles and 2,000-vertical feet to the east. The road follows a tumbling creek shaded by tall trunk grottos. It is steep but no oppressive and has little automobile traffic. 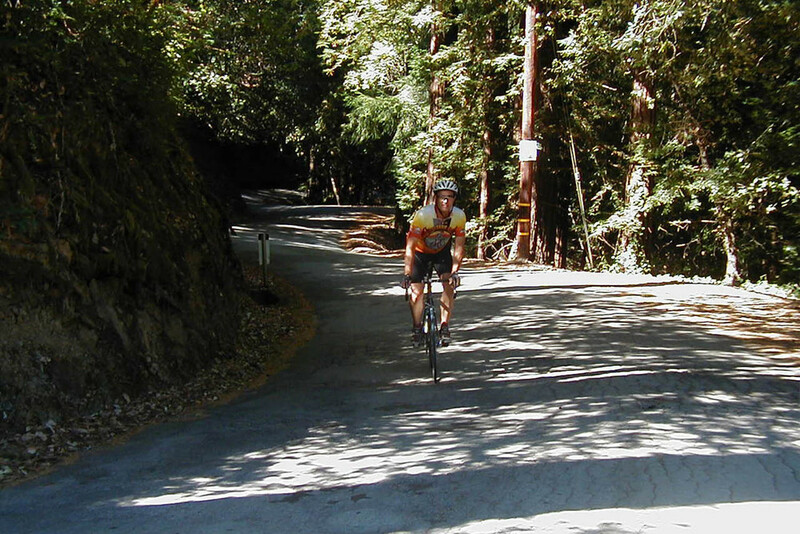 For Bay Area bikers sojourning to the coast, it is the premier return route to Skyline Blvd. (Highway 35). The expedition led by Spanish Conquistador Gasper de Portola camped here in 1769 on its march up the coast to the ridge atop Pacifica. Crossing San Gregorio Creek, Portola named the area the Valle de Los Cursos, or Valley of the Curses, for intestinal troubles of the most common digestive sort. A little further north, just beyond Tunitas Creek, the Spaniards camped at an Indian village which they named Rancheria de las Pulgas, or Village of the Fleas, yet another affliction. The name was later used by a md-peninsula rancho, namesake of the current boulevard named Alameda de las Pulgas. Tunitas Creek later was part of a Mexican land grant, typically given at the time to encourage ranching, in an area where money couldn’t buy much. The Rancho Cañada de Verde and Arroyo de Purisima (Green Valley and Most Pure Creek) was granted in 1838. Tunitas is not named for little tuna fish; instead a turn is Spanish for the fruit found on a prickly pear cactus. An 1839 map named the creek as Arroyo de las Tunitas, naming it for the cactus fruit found near the lower portion of the creek. A few non-Mexicans in California at the that time were mostly English sailors who had jumped ship or tough American mountain men who had wandered in from the Nevada deserts. Over a a decade later, after the Bear Flag Republic revolt, the War with Mexico treat and the Gold Rush, the area was full of disappointed god seekers, seeking other means of livelihood. These disgruntled immigrants couldn’t understand or tolerate so much land being owned by so few land grant holders (of course, almost all Mexican or Spanish), with their tiny adobe structures, raising sheep and cattle over their several thousands of acres. With booming San Francisco demanding time, the Woodside redwood trees lured lumberman, operating saw mills up the underpopulated eastern slopes off Skyline, using haul roads to drag down the old growth trees. The former Mexican residents didn’t appreciate their property rights not being respected for one thing and also were upset that these busy Yankees were denuding the once beautiful hillsides. Legal battles over the old Mexican land grants continued for decades. Road companies soon formed to build turnpikes, or toll roads, to charge travelers to cross over the ridge to the coast. The Redwood City and San Gregorio Turnpike was built in 1868 up what is now Kings Mountain Rd., named for the Mountain Brow House Resort owned by Frank King and later by his widow. The turnpike followed what is present-day Tunitas Creek Rd. until it forked left through the Star Ranch to San Gregorio. A year earlier, Eugene Froment bought 750 acres on the backside of the ridge. It was a tow-day haul to Redwood City. At the resting spot, east of Skyline ridge, he built the Summit Springs Hotel one mile east of the ridge, complete with store, blacksmith shop, saloon and school. A timber camp meanwhile began to work the west side of the ridge, extending down to an area known as Grabtown, named for loggers grabbing land for their shacks where they could find it. In 1872, lumberman Alexander Gordon built a 45-degree angled wooden chute for longs to slide down from the wooden slopes to his ship-loading dock. Three years later, he was partners in constructing the Tunitas Creek Turnpike Rd., also partially owned by Froment, with his own business suffering from a nationwide depression that had begun in 1873. Eventually, Gordon’s lumber business also went bankrupt. The abandoned chute was wrecked by storm 1885. As it turns out, much of the wood taken off the mountains over the years burned in several San Francisco fires during the late 19toh century, culminating with the great fire following the 1906 earthquake. San Mateo County purchased the two turnpikes on either side of the ridge in 1884, enabling Froment to buy an acre near the mouth of Tunitas Creek, where he lived with his wife until his death in 1892. Two years later, the western road still called Froment Rd. on a county map. Sawmilling upper and lower Tunitas Creek continued with a series of owners until the last shingle mill burned in 1907. In 1905, rich San Francisco businessmen formed the Ocean Shore Electric Railway Company, the goal of which was to establish a double track electric railway from San Francisco to as far south as Santa Cruz, the area’s most popular summer resort. Three years later, the tracks reached Tunitas Creek where the line stopped opposite the Easterday residence as passengers continuing south boarded a Stanley Steamer automobile for Swanton, just north of Davenport, where the rest of the railroad line took them into Santa Cruz. As the lonely Tunitas terminal lived artist Sybil Easterday, a sculptor and pet known as the beautiful and exotic girl of the desolate coast. She married at age 39 in 1915 to Louis Paulsen when they opened up a small saloon at the Tunitas Creek train stop. Paulsen committed suicide a year later and Easterday remained as an eccentric widow at her home until her death in 1961. Rock slides along the track disrupted rail business but finally the automobile made it easier for tourists to get to the coast as was goods to be trucked out. Motor tours were offered by Kissel Kar in 1913, touting a route to Half Mon Bay via Kings Mountain and Tunitas Creek roads. New La Honda Rd., now Highway 84, was built by 1915, facilitating the drive to San Gregorio, replacing the previous curvy road, called Old La Honda Rd., which had been built 30 years earlier. By 1920, The Ocean Shore Railroad was done. A wooden trestle, built to cross Tunitas Creek, never got used and finally burned in 1940. Skyline Blvd., or Highway 35, atop the ridge was built in 1929, connecting Kings Mountain Rd. to the new La Honda Rd. Approaching the Tunitas Creek Rd. on bicycle from the south means usually taking Stage Rd. from the San Gregorio general store. After a short distance on Highway 1, a broad view of the ocean and beach opens just as you speed down and across the Tunitas Creek highway bridge before making a quick right. Coming form the north, a shorter approach to Tunitas Creek Rd. is to take the second Verde Rd., named after the former Rancho Cañada Verde. After a quick up and down, the road splits into Lobitos Creek Rd. on the left or, bridging School House Creek, into the Lobitos Creek Cut-off on the right. Lobitos in Spanish means “little wolves.” In that era, sea lions were called “lobo marinos” or “sea wolves,” which is how Point Lobos, on the coast for both in San Francisco and Monterey, was named. Lobitos Creek is therefore the Creek of the Seals, the smaller version of sea lions. Lobitos Creek Rd. to where it joins with Tunitas Creek Rd. is actually longer than the cut-off by a half mile and has half again more climbing. Once Lobitos Creek Rd. rejoins Tunitas Creek Rd., the real climbing starts, with the beginning of six right hard hairpins, including a half mile 12 degree section. Eventually the grade eases at the former Grabtown site, where the ridge follows with the final few miles to go. A rail gate on the left is the entrance to Bald Knob, now open space property, purchased in 1993 with a trail available to mountain bikes. It is hard to believe the hilltop was once barren of trees due to logging. Star Hill Road from the right signals just over a mile before the wide open Skyline Highway 35 intersection, where a “Caution Log Trucks” sign is still posted. The return down Kings Mountain Rd. looks pretty inviting through the cool redwoods, gently at first, past the sunlit hillside where the old Summit Springs Hotel once rested, before the road drops rapidly to Woodside below with busy I-280 in the distance and the metropolitan areas beyond.